Clark Agricultural division of Clymer Coulter Enterprises has grown into an international supplier of quality commercial fertilizer application including nitrogen fertilizer injection systems, liquid fertilizer injectors, utility coulter tillage blades, farm coulter disc parts, disc sealers and coulter replacement plow disks. 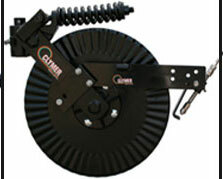 A full line of coulter accessories including coulter blades, coulter knife assemblies and farm implement clamps that mount to most any agricultural implement or farm toolbar .Assembled in America, Heavy-duty spring loaded stream injection systems for coulter blades make commercial fertilizer application reliable planting season after planting season. Reliability that increases planting efficiency year after year.Clymer coulter blades available – Smooth-Edge Coulter Blades, Ripple Coulter Blades, Wavy Coulter Blades, and Notched Disc Blades. 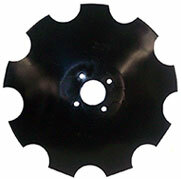 All coulter disc blades are available with sealed hub assemblies to prevent water from getting into bearings. Copyright © 2012 Clark Agricultural Equipment | All Rights Reserved.